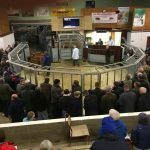 Stirling – United Auctions on Thursday March 28 sold 6281 prime sheep comprising of 12 new season lambs & 4735 old season lambs selling to an average of 197.04p also 1534 ewes and rams. New Season Lambs (12) – West Lecropt (Hamp) £102.00; Greystone (Zwa) £101.00; Wood (Dor) £100.00. New Season Lambs (12) – Wood (Dor) 218.00ppk; Whitehouse (Zwa) 207.00ppk; West Lecropt (Hamp) 204.00ppk. Old Season Lambs (4735) – Luckenburn (BTex) £124.00; Grassmainston (Tex) £106.00; Harviesmailing (Cross) £105.00; Berrydyke (Suf) £100.00; Pityot (Chev) £98.00; Markethill (Mule) £93.50; Kilmundie (BF) £89.50. Old Season Lambs (4735) – Luckenburn (BTex) 284.00ppk; Longfauld (Tex) 262.00ppk; Harviesmailing (Cross) 241.00ppk; Abbey (Chev) 240.00ppk; Wardhead (Suf) 220.00ppk; Glrndamph (BF) 204.00ppk; Craggan (Mule) 203.00ppk. Ewes (1534) – Pitlochie (Tex) £158.00; Isle Cottage (BTex) £112.00; Shannochar (Suf) £104.00; Broadleys (BFL) £96.00; West Lecropt (Hamp) £94.00; Greystone (Zwa) £91.00; Assloss (Chev/Mule) £86.00; Higham & South Falfield (Cross) £77.00; Newmill of Inshewan (Che) £74.00; Coulshill (BF) £71.00. Rams – Luckenburn (Tex) £116.00; Glass (Suf) £96.00; South Baldutho (Cross) £94.00; Isle Cottage (BTex) £90.00; South Park (BFL) £87.00. Overall Champion was a Limousin from D Reid, Middlerigg, Falkirk which sold to £1360 or 239ppkg. Reserve Champion was a Limousin Heifer from J and D Mitchell, Offers, Gargunnock which sold to £1110 or 242ppkg. Bullocks averaged 211ppkg selling to 262ppkg for an Aberdeen Angus from J McKenzie, Ashfield, Balloch and to £1360 for the Overall Champion. Heifers averaged 207ppkg selling to 242ppkg for the Reserve Champion, and to £1120 for a Limousin from J Geyer, Blairhall, Culross. 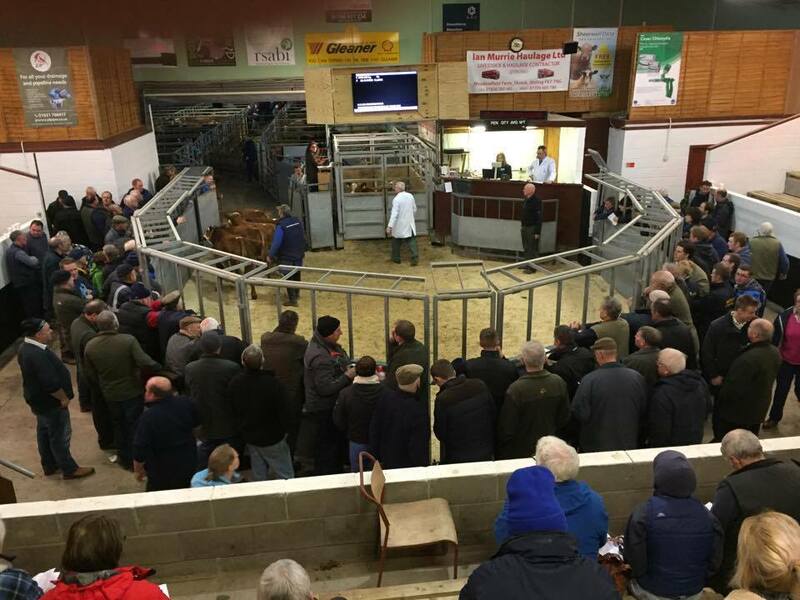 Black and Whites Averaged 131ppkg selling to 160p from D T Marshall, West Kirkland, Newton Stewart and to £700 twice from W Baxter, Gryfeside, Kilmacolm. Also forward were 400 Store Hoggets and Breeding Sheep. Top price of the day went G S Adam, Hill of Arnmore for a Texel X Grit Ewe at £105.